Yard Art do-it-yourself yard decorations include terrific patterns for Halloween, Christmas, other holidays, and everyday themes. These step-by-step projects include easy-to-follow instructions and a list of the tools and supplies needed to complete each pattern. Yard Art is the perfect way to liven up your front or backyard all throughout the year, while creating a great pastime the entire family can enjoy together year after year. 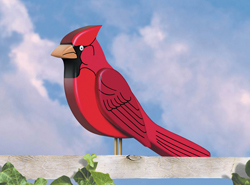 Browse our large collection of Yard Art designs and find just the pattern or scene perfect for your yard. View hundreds of other yard art patterns if you're looking for a fun way to decorate your yard for Christmas, Halloween, or all throughout the year. House Plans and More also features easy-to-build project plans featuring indoor project plans, sheds, deck and gazebo designs, backyard projects, and other building blueprints.